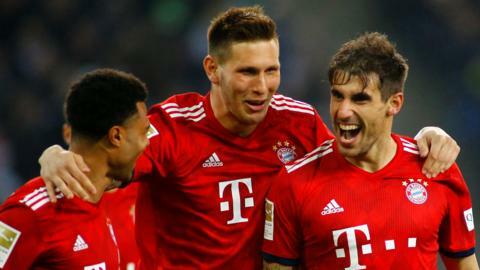 Bayern Munich cruise to victory at Borussia Moenchengladbach to go level with Bundesliga leaders Borussia Dortmund on points and games played. Jadon Sancho scores as Borussia Dortmund bounce back from a first Bundesliga defeat of the season to beat Borussia Monchengladbach. The official Twitter account for the Bundesliga tells Borussia Monchengladbach they can "have the league" if they get 50 million retweets on a post. Three different players score hat-tricks as Borussia Monchengladbach thrash fifth-tier Hastedt in the German Cup. Manchester City boss Pep Guardiola says he is "lucky" he cannot face old club Bayern Munich in the Champions League last 16, as both clubs qualify second in their groups. Former Celtic goalkeeper Pat Bonner rates the performances of Celtic's players following their 1-1 draw with Borussia Monchengladbach.